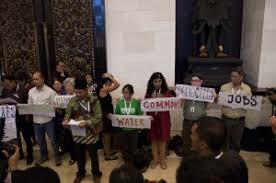 The 9th Ministerial Conference of the World Trade Organization (WTO) pushed through a Bali Package in the final hours, extending the Conference to December 7, but at the cost of the developing countries, the poor and the hungry. Added to this, is the hypocrisy that this Trade Facilitation deal will open borders in all Member countries except Cuba, as it does not effectively cancel the 60-year long US blockade against Cuba. The reference to the non-discrimination principle of Article V of the GATT 1994 remains pure rhetoric as it is stated in the Declaration and not in the text of the Trade Facilitation Agreement. In exchange for the costly, legally binding agreement on Trade Facilitation, developing countries received nothing. – There is a very bad peace clause that violates the right to food and jeopardizes the right to food sovereignty as it places numerous restrictions on the ability of developing countries to give support to their small farmers and poor constituents. – The peace clause only applies to existing public stockholding for food security programs that exceed the Aggregate Measurement of Support (AMS) or de minimis, as of the date of the decision, effectively meaning that only India can apply it and that no future food security programs of developing countries will be allowed. – There is a promise of a permanent solution but subject to future negotiations during the next 4 years. What that permanent solution will be is an uncertainty. Finally, this peace clause is nonsense simply because no country should have to beg for the right to guarantee the right to food. Food and agriculture should never have been included in the WTO in the first place. In Cotton, a long-standing demand of African countries, also a promise in the Hong Kong Ministerial Declaration that never got implemented. Today, in the Bali Package the promise is to have “dedicated discussions” post-Bali. The Bali Package has a Least Developed Countries (LDC) Package but with nothing substantial or meaningful. The special and differential treatment and monitoring mechanism are old unfulfilled promises that remain a declaration today. In summary, the Bali Package delivers a legally binding text on Trade Facilitation, a very bad peace clause on food security that jeopardizes our right to food sovereignty, empty declarations and promises on long-standing developing country demands on export subsidies, cotton and the LDC issues. The WTO has once again shown that it is an organization for the developed countries and the TNCs, pushing free trade rules that only benefit the rich and concentrate even more wealth in the hands of a few. It has not and never will deliver development for the people. The WTO is a failed and delegitimized institution that is desperately trying to revive itself with a Bali Package at the high cost of food sovereignty, livelihoods, jobs, and the future of the people. We reiterate our call for an End to the WTO and the tyranny of the free trade regime. We redouble our efforts in fighting the system and pushing for the peoples’ alternatives. We will continue our struggle to achieve a world without the WTO and free trade agreements and in its place have an Economy for Life. REMOVE MAYNILAD! SOLVE THE WATER CRISIS IN POOR COMMUNITIES! The Colombo Declaration : "10 Years is Enough-No Deal at the WTO Hong Kong Ministerial Meeting!"